The competition among developers to win the rights to develop the deeply toxic parcel of land between Smith Street and the Gowanus Canal known as Public Place took a step forward this week with the release of this rendering. 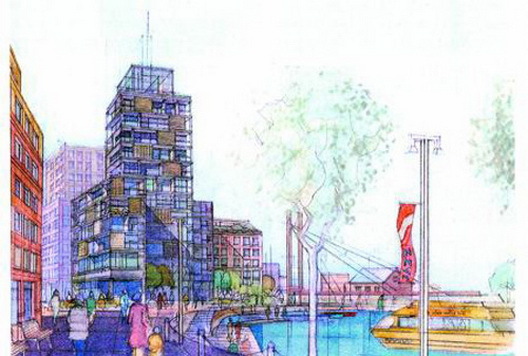 It shows the Avalon Bay vision for Gowanus and includes a number of mid-rise buildings, going up to 12 stories. Look, however, at the way the rendering depicts the Gowanus, which looks more like the Hudson River in Battery Park than, well, the Gowanus Canal. (It was given to the Brooklyn Daily Eagle.) The proposal would include six buildings, 425 affordable rental units and 326 condos. It looks like one of those grand Kitchen Sink proposals with something designed to appeal to almost any possible constituency in the community: a 14,000-square-foot supermarket along Smith Street, another five retail locations with 18,400 square feet, 11,400 square feet of artists' space, a 2,500-square-foot art gallery, a 3,200-square-foot restaurant, a 5000-square-foot environmental centers and a 1,200 square-foot youth center, a 5,400-square-foot senior center and a 2,500-square-foot boathouse and pedestrian walkway on the Gowanus. Other competitors for the choice expected next year include Related Companies, Two Trees Management, The Hudson Companies and The World-Wide Group. All the development teams include politically-connected local groups, so expect the final decision to be made on factors that may transcend the merits of the individual plans. None of the plans address the thorny issue of cleaning up the gravely polluted parcel, which is a prerequisite for any development. Public Place is public open space, park land. I don't see the park in this rendering. Public Place is a brownfield. I don't see the special bulkhead wall that the DEC is designing to contain the contimination. This must be a drawing for another location put out here to baffle all.